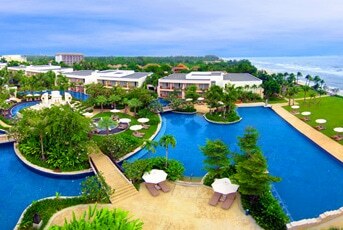 Sheraton Hua Hin Resort & Spa is one of the latest seaside hotels in Thailand. The resort mixes the convenience and relaxed atmosphere of Hua Hin and it provides endless ocean views, Thai Kindness, and the finest in five-star convenience. A vivid and relaxing atmosphere and employees with a interest for great service guarantee to help you make remembrances forever.